I couldn’t be more thrilled to share our master small bathroom design remodel pictures today! This space is obviously my new favorite room in the house. I just LOVE it to pieces. If you remember the before photos we shared of this space and our small bathroom ideas post for the space, we weren’t working with a lot to start with. Ha! By moving out a wall about 30 inches, adding a larger window and a few other tricks we learned along the way – this small bathroom design is now doing BIG bathroom design work. Follow these bathroom design for small spaces ideas we came up with to add an instant win to any bathroom you might be tackling soon. 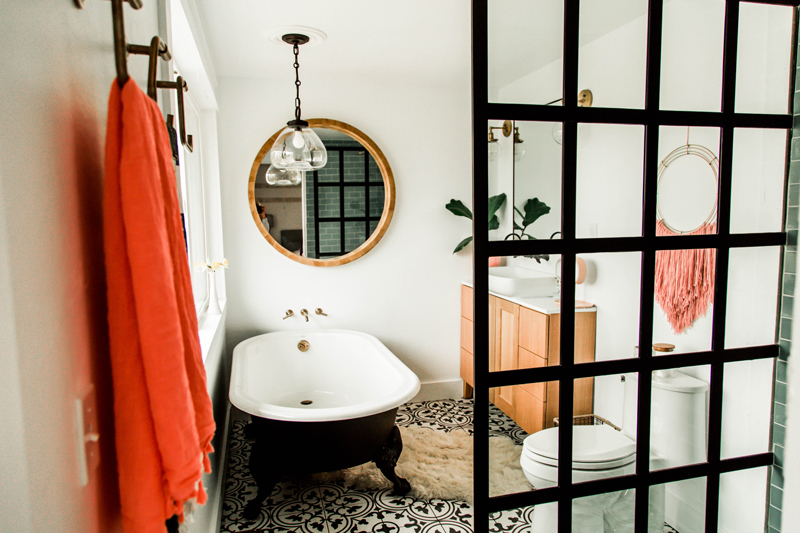 We partnered with Wayfair as a part of their 1 room challenge for this space and also included a few amazing pieces from Kohler (like the tub of my dreams) and a glass shower door from Coastal Shower Doors to bring a load of style into this tiny space. 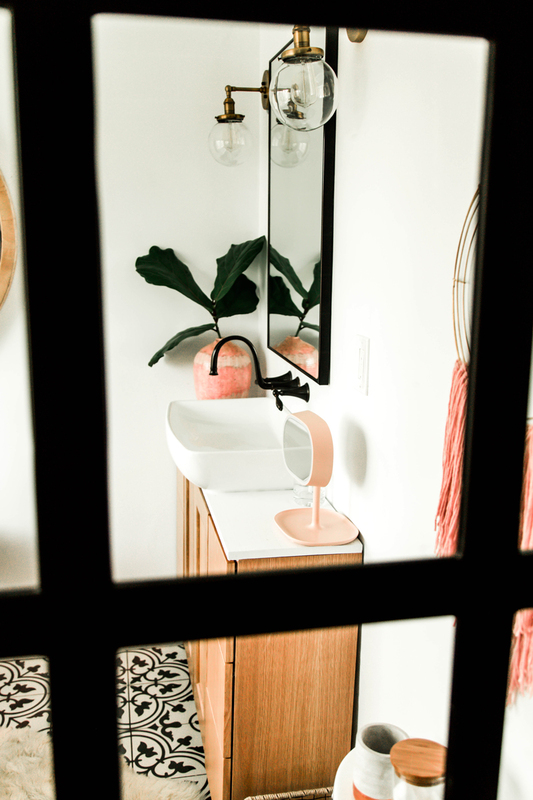 When I was dreaming about our small bathroom and how it might turn into something grand, I knew I wanted to have a bold sophisticated look to the space. 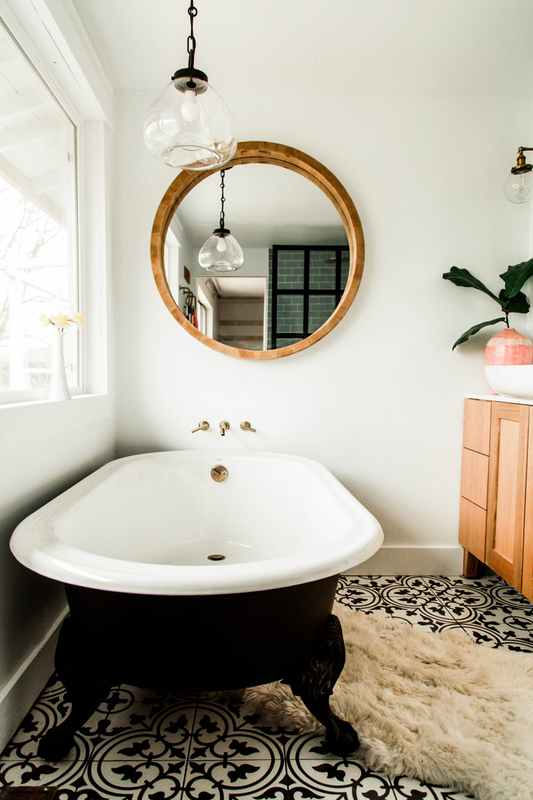 The clawfoot tub of my dreams makes a huge impact in the space, it was one of the many risks we took in planning this bathroom design for small spaces that definitely paid off. 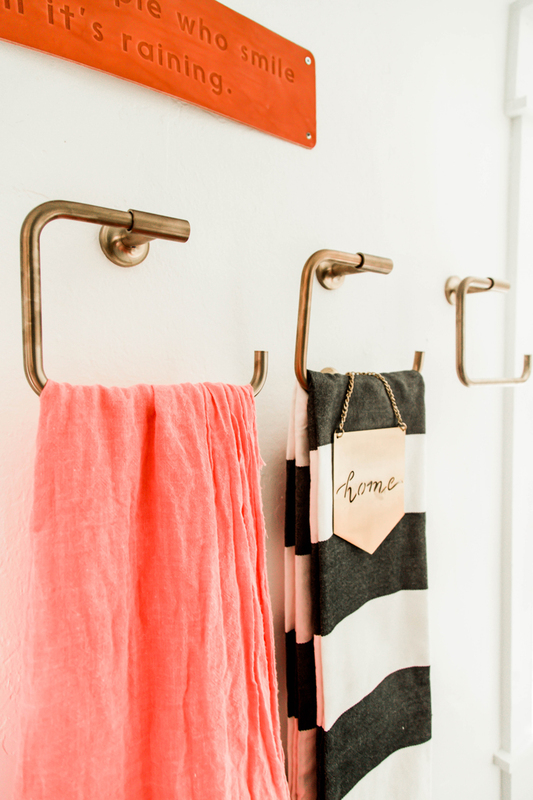 One of the big challenges of a bathroom design for small spaces is budgeting your space. I knew I wanted a BIG clawfoot tub, so that means I had to give up room somewhere else. Treating the space much like a bank account with only so much equity to go around, helped us to prioritize what we really wanted the master bathroom to be. If you were following along on my IG stories as we did the space, you’ll remember we ended up with a major vanity issue. One of the design challenges when working in a small bathroom is the tightness to fit everything in. We measured and measured again, even looked up information on how to design for tiny spaces and thought we had it perfectly mapped out. Until our vanity came and we realized it was WAY to deep for the space. I set out to find another option, but just loved this one so much. Nothing else measured up. So we did what any sane renovation family would do and found a friend to slice the vanity in 1/2 for us! We took off 1/2 the depth and it now fits perfectly in the small bathroom design. All is well that ends pretty… I like to say. But, be sure you leave wiggle room if taking on a small bathroom is in your future. We employed a few design tricks in this bathroom design for small spaces that really bring the space to light. The first is doing double duty with the mirrors. Since we put in a very large window over the bath, I knew I wanted that light and the nature outside to bounce around the bathroom. We put up one mirror over the vanity and hung another huge circle mirror over the tub. The addition of the second mirror worked really well to make the space feel incredibly open and bright. We also is hid the toilet paper. HA! An amazing small bathroom design trick that I learned from a friend. When your vanity has drawers, it is easy to install a toilet paper holder in one of the drawers – so you don’t have to break up the flow of the design with that. Along with putting a trash can in that connects well to the design of the space, the bathroom feel less utilitarian. Sometimes it’s the little things that really open up a space and make it work. We also used all the glass we could to ensure the small master bathroom felt totally open and not chopped up into pieces. This not only created the best small bathroom design remodel pictures, but made the space basically sing with joy! The window we installed (see the old one right here) was a great starting point. 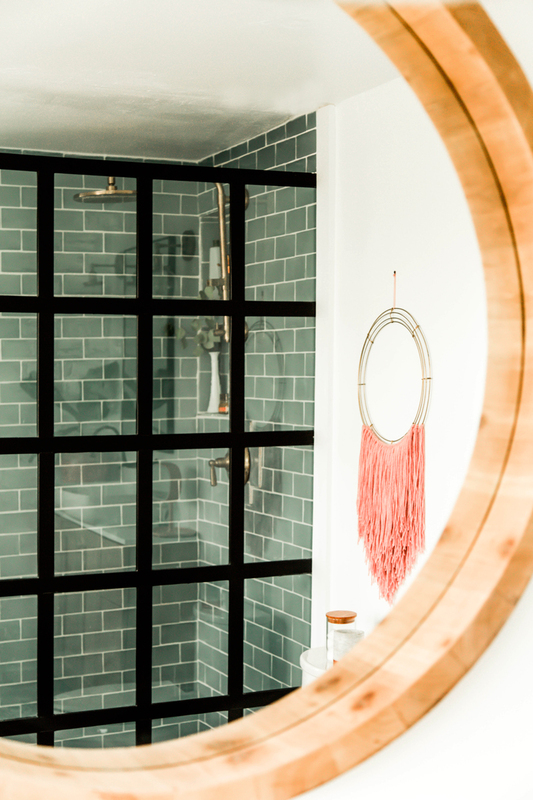 We added this beautiful door from Coastal Shower Doors – that acts less as a shower barrier and more as a picture frame to the rest of the bathroom. I love it so much! Creating a window here, instead of a wall, allows all the bright light to flow right into the shower area and really does make the old bathroom floor plan seem enormous now. Now that I’ve shared my bathroom design for small spaces tricks, let’s talk tile! We’ve laid a LOT of tile this last year in our festive home renovation. This tile though takes the cake as my favorite tile ever! When we initially started planning our small bathroom design, I heard so many people say – don’t go bold with the tile in a small space. I am so happy I didn’t listen to that. This pretty concrete look printed tile on the floor makes a huge impact in the space and instantly makes it feel grand. While the more natural looking tile on the shower walls brings a cozy warmth to the space. Although, it’s hard to tell fully how tile looks through the small bathroom design remodel pictures – I love that this tile in person looks really natural, almost like stone. 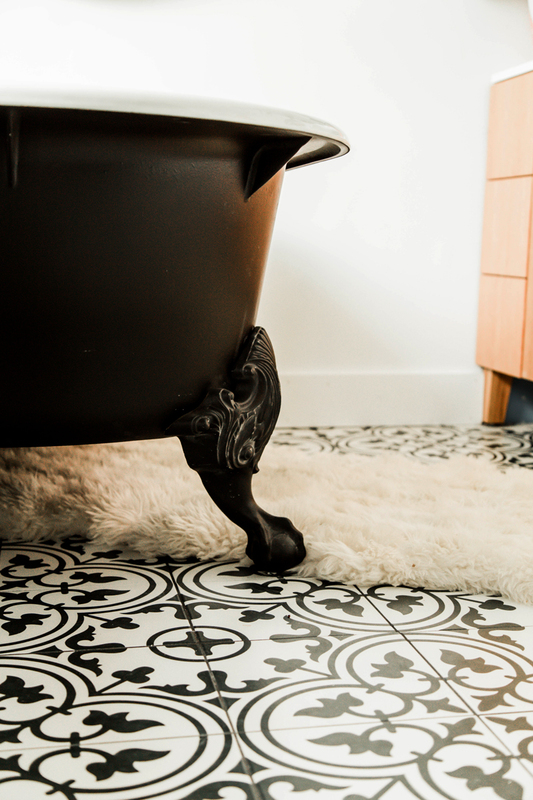 The edges aren’t perfect and that contrasts even more with the bold floor tile to create a custom bold + cozy look that is 100% my style. In a small space we don’t have much room to really add a lot of extra design elements. It would be very easy to make this small bathroom design feel busy and cluttered, which was not what I was going for. at all. Instead of adding all the things, we got very picky with the functional elements in the room and demanded that they be beautiful as well. 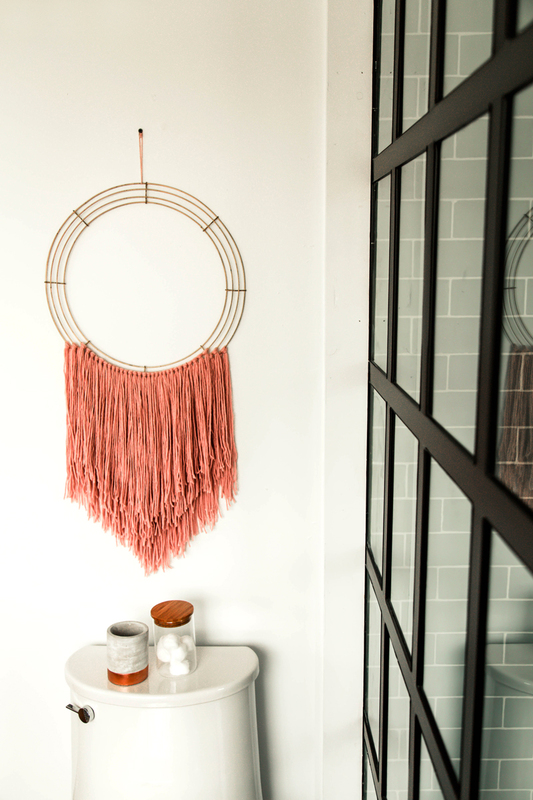 These pretty towel rings from Kohler do a necessary function of holding our towels, but hanging 3 in a row also creates an artistic focus on the wall. With a simple leather sign above (that I couldn’t help but buy when I was at Magnolia last month), makes the wall feel styled without being cluttered. 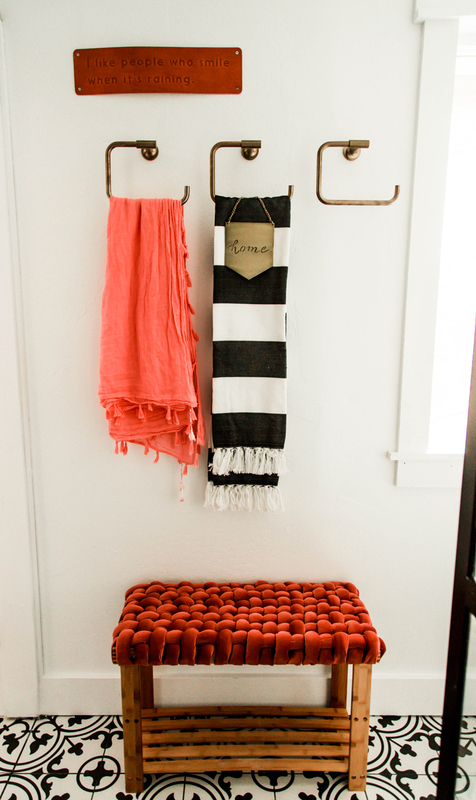 We also brought in my favorite DIY bench to have a place to sit when needed and rest supplies for bath time. 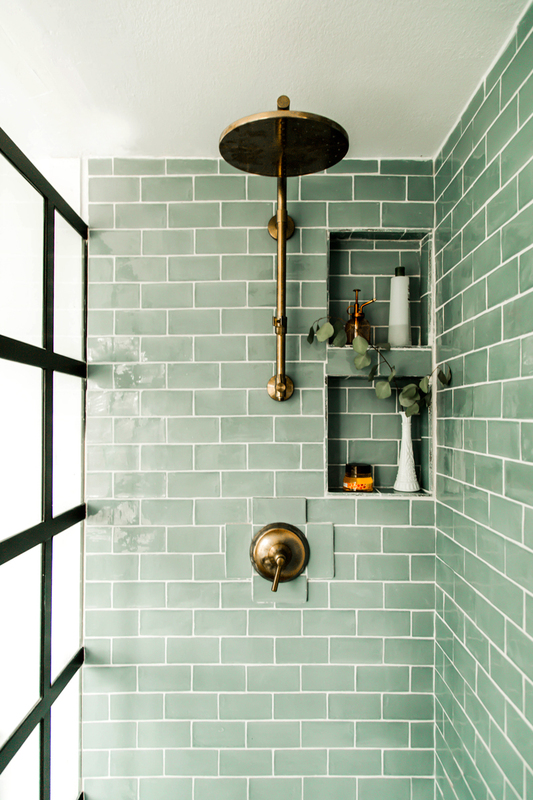 It’s all in the details in a bathroom design for small spaces that can make or break it. From the simple woven yarn wreath to the bold lighting we worked hard to add interest and texture in a way that would create more of the open sophistication we were after, but still staying true to my colorful and cozy style. 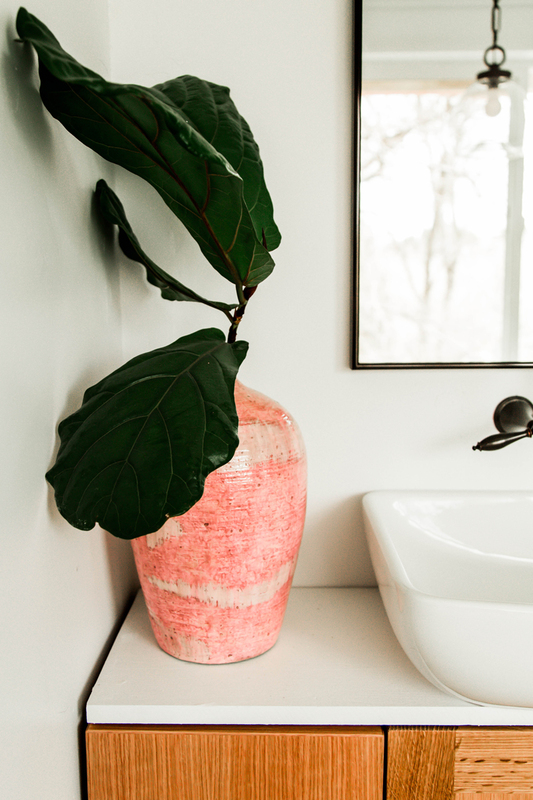 We used a large colorful pot with a fiddle fig clippings which makes a much larger style statement than using smaller elements in mass and the mismatched faucets create a flow with the brass/black features in the space. 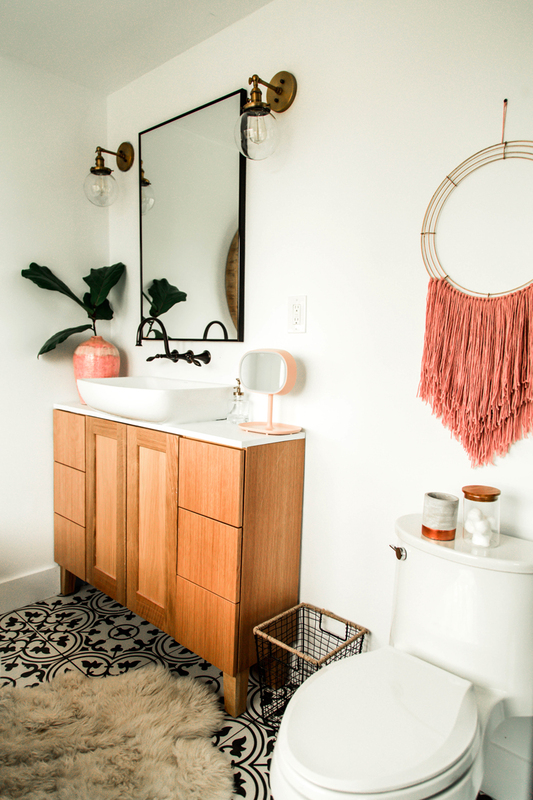 It’s easy to think about wanting to match everything exactly in a small bathroom design, but finding ways to play elements off one another brings in a life that any space needs to feel thoughtful and pretty. 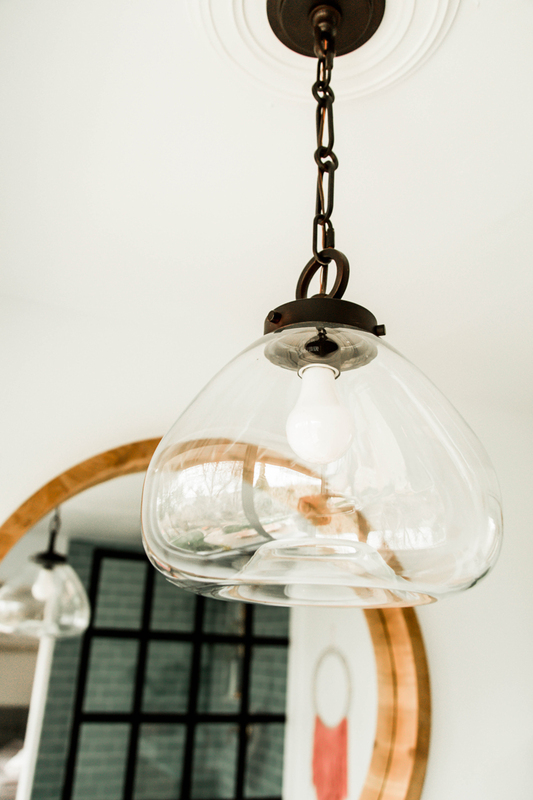 We also mirrored the light with the black hanging pendant and the brass sconces over the vanity. This mixed metal play was easily my favorite addition of texture in the bathroom renovation. You guys… I took a bath the other night and stared out at the stars and felt like I was literally in the bathroom of my dreams. Such bliss! Although this bathroom was saved for last and took us nearly 2 years to get to, remember how I had that bathtub sitting in my bedroom FOREVER! The fact that we waited so long for it, only made the finish of the space sweeter to me. 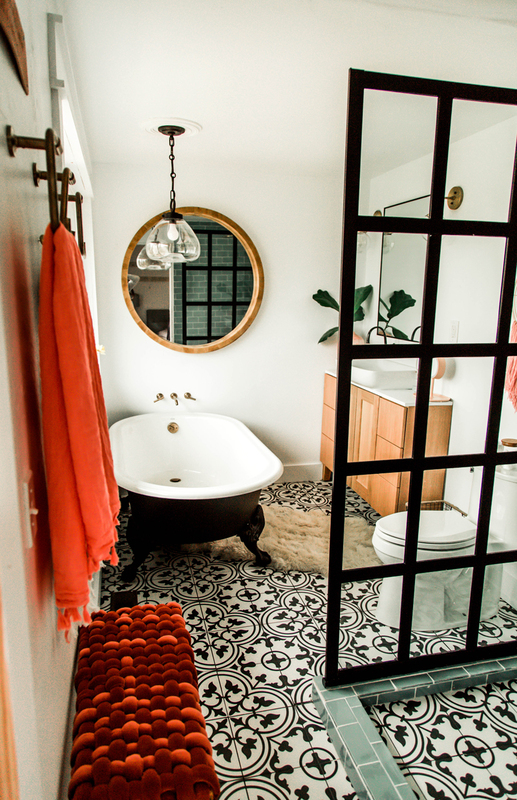 Being our last MAJOR interior renovation project from our initial move-in list, the bathroom design for small spaces really was the sweetest note to end this phase with. 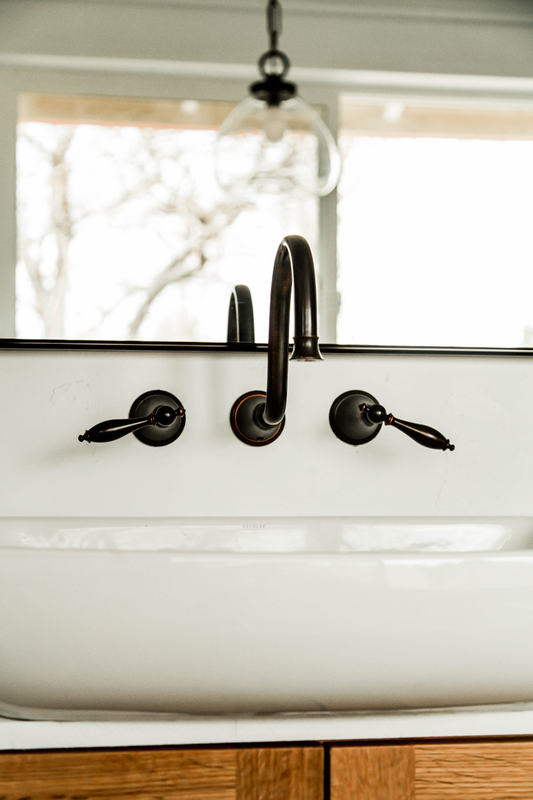 Everyone’s small bathroom renovation costs will differ based on so many issues. For us, since Matt did SO MUCH of the work himself we ended up saving a ton of money. We did hire out the window installation, even though Matt did the basement bathroom window himself this one had to be done on a ladder since it’s a second story bathroom and we didn’t want to risk death in the process. ;) We also hired out the plumbing and bought a pre-made shower kit after the craziness of laying our own shower almost destroyed our marriage. EEEK! It was well worth the money spent. 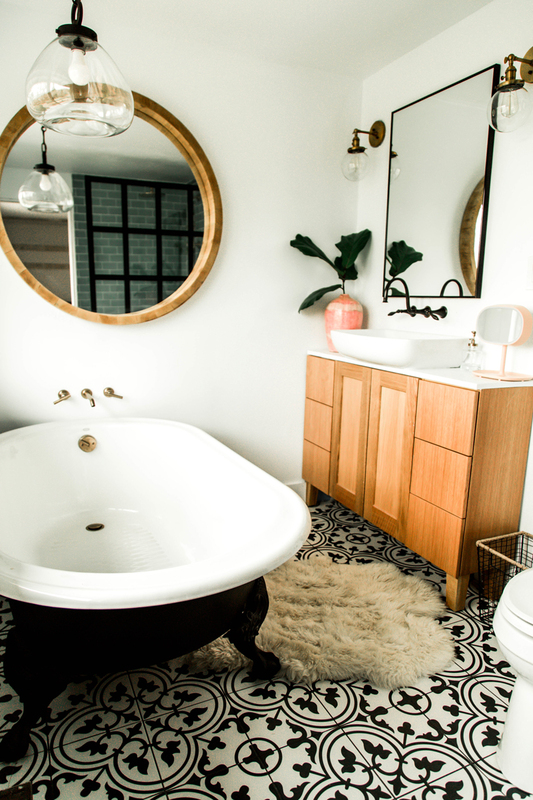 I will say, as far as budget goes in bathroom design for small spaces – splurging where you can on the bathtub of your dreams or a tile you really love will go a long way in making the entire space one you love. Here is a list of all the products we used in the small bathroom renovation. Let me know if you have any other questions about the space. THE BATHTUB!, Gridscape Glass Shower Door, Kohler Poplin Vanity, Sink, Bath Tub Faucet, Sink Faucet, Toilet, Floor Tile, Shower Tile, Shower shelf build inserts, DIY Bench, Vase, Mirror Over Vanity, Large Circle Mirror, Shower fixtures, Towel Rings, Hanging Pendant, Medallion, Wall Scones. PS. More bathroom inspiration in our basement bathroom renovation & the kids shiplap bathroom. You have room for a tub and stall shower?! You have no idea what a small bathroom is. Lol! It’s beautiful, though. Oh, gosh! That can be so hard. We did move the wall out into our bedroom to create room for the shower and I am SO happy we did that! Otherwise, we would have never been able to fit both in there. I really liked these small bathroom designs and remodeling pictures. These are just amazing. Thanks for sharing this post. The Fantastic bathroom renovation technique you apply. All bathroom tools are shower to looks your bathroom like a drawing room for it is decoration. Thanks for your great information. 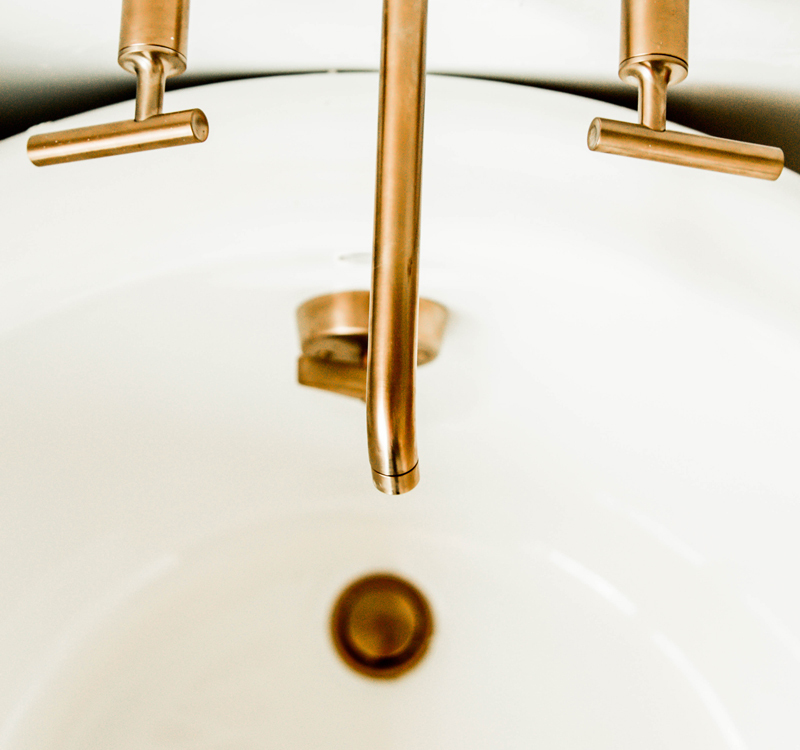 The shower fixture you linked to on Wayfair looks so different than the one in your bathroom. Did you modify it somehow? Hi! Can you share the dimensions of your bathroom for reference point? It’s beautiful! Hi! I when I follow the shower tile link to Wayfsir the tile looks so blue! And yours look very green to me…? Please help:)) love your bathroom! Lauren, Thanks so much! That is for sure the correct tile link. I think depending on the light it can look more blue or green. Ours reads as a really pretty seafoam and I love it. Hope that helps! Wayfair does have a great return policy so if you try a sample and don’t love it, you can always send it back.